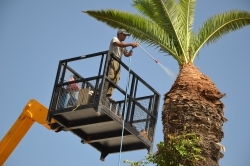 Treatment against Red Palm Weewil in the streets of Tunis. 23 June 2017, Bari – FAO Director-General José Graziano da Silva speaking today to students and staff of the International Center for Advanced Mediterranean Agronomic Studies (CIHEAM), stressed the need for agriculture and food systems to be transformed in order to face the impacts of climate change and to ensure that the world’s natural resources are safeguarded. The FAO Director-General in his speech at an award ceremony for students at CIHEAM’s institute in Bari, noted that “scientific research and innovation are essential elements for sustainable development”. He underscored how globally, there is a need to implement sustainable agriculture and food systems that offer nutritious and accessible food while at the same time building climate-change resilience. Noting that the collaboration between CIHEAM and FAO goes as far back as 1977, the Director-General highlighted some of the joint areas of work related to overcoming the enormous challenge to food and security and sustainability faced by Near Eastern and North Africa Mediterranean countries. In March, FAO and CIHEAM co-organized a high-level technical event on the management of the Red Palm Weevil – a destructive pest first detected in South Asia that has since spread to attack more than 40 palm species worldwide with the Mediterranean countries the most at risk. FAO and CIHEAM have also worked together on the Blue Hope Initiative, aimed at strengthening livelihoods in coastal communities in the Mediterranean particularly affected by migrant flows. It is composed of 13 member States (Albania, Algeria, Egypt, France, Greece, Italy, Lebanon, Malta, Morocco, Portugal, Spain, Tunisia and Turkey) and operates through its 4 Institutes based in Bari (Italy), Chania (Greece), Montpellier (France) and Zaragoza (Spain) and a General Secretariat based in Paris.